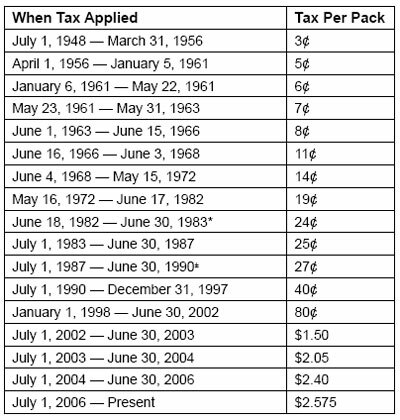 At one time or another in the past 70 years, New Jersey has held every position in the cigarette market: tax-exempt supplier of cigarettes to other states, moderate-tax state with only minor law enforcement problems; high-tax state discovering the problems of cigarette tax evasion; once again a moderate-tax state that had let other states surpass it with tax hikes; and finally, at present, the state with the second-highest tax rate, some of the worst crime and the second-most tax revenue lost to smuggling. Source: Orzechowski & Walker. * Indicates when the surtax escalator was enacted. ± Indicates when the surtax escalator was repealed.